Team building at Layer Marney Tower01206 330784work Team building activityLayer Marney Tower is the ideal venue for team building activities whether you have a team of 4 or 400. The magnificent Tudor gatehouse, the tallest in England, is set in 120 acres of parkland and extensive gardens, both the buildings and grounds are at the disposal of the team builders. Team building activities can take place in all weathers and at any time of the year, both inside and outside. There is ample space for paint-balling or GPS treasure hunting, ample opportunities for activities which stretch the brain or are physically challenging. Whether you want to reward you staff or help to work better together as a team, Layer Marney Tower is a fantastic place to bring them. A chance to get out of the office and spend the day in a totally different environment will make a huge difference to their back at work performance. Our caterers can provide excellent refreshments throughout the day. We work with specialist team building companies to provide a really fantastic experience. Glamping at Layer Marney Tower. Glamping? Forget memories of sleepless nights tossing and turning, trussed up in a sleeping bag feeling every lump of the ground beneath you. 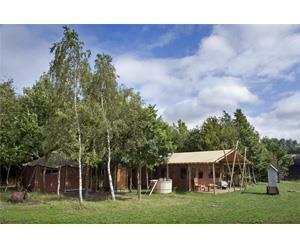 Layer Marney Tower's latest venture is "posh" camping. Where luxury is the order of the day. Glamping at Layer Marney Tower is under the sort of canvas that graced the African plains during the reign of Queen Victoria. Livingstone and Stanley would feel quite at home here in the style of tents their retinues would have pitched at the end of a hard day tramping the savannah. As gentlemen, they would have expected life's little luxuries like a comfortable bed, a wooden floor and proper furniture. There are six luxury tented encampments at Layer Marney Tower, each named after a wife of Henry VIII. Each encampment has a main tent, with six sleeping canopies that can accommodate up to six people, next door the Discovery Tent has more camp beds for extra guests you may like to invite. The encampments are very well equipped, the kitchen has everything from knives and forks to coffee grinders, no need to pack up the kitchen when you come. There is running water to the kitchen sink and a proper flushing loo. You make your own electricity to light your tent by cycling on a static bicycle. Each encampment has its own shower and the most popular addition - a hot tub. There is an outdoor cooking cart, like an Aga on wheels and there is another wood burning cooking stove inside the tent. In your Discovery Tent you and your family will be immersed in a learning environment from yesteryear. There is a microscope to examine the mysterious things you discover around the tent. A field telephone, a telescope, artists' equipment, reference books, binoculars, things to help you enjoy your stay in the countryside. Layer Marney Tower is the ideal venue for team building activities whether you have a team of 4 or 400. The magnificent Tudor gatehouse, the tallest in England, is set in 120 acres of parkland and extensive gardens, both the buildings and grounds are at the disposal of the team builders. There are deer grazing near the encampments, highland cattle in the fields, collect your breakfast eggs from the chickens who are scratching around by the Bothy, the little shop where you can buy your basic provisions.